The first clinical trial of an implantable microchip-based drug delivery device produces very encouraging results. ASSAY & Drug Development Technologies offers a unique combination of original research and reports on the techniques and tools being used in cutting-edge drug development. The journal includes a “Literature Search and Review” column that identifies published papers of note and discusses their importance. GEN presents one article that was analyzed in the “Literature Search and Review” column, a paper published in Science Translational Medicine titled “First-in-human testing of a wirelessly controlled drug delivery microchip.” Authors of the paper are Farra R, Sheppard NF Jr, McCabe L, Neer RM, Anderson JM, Santini JT Jr, Cima MJ, and Langer R.
The first clinical trial of an implantable microchip-based drug delivery device is discussed. Human parathyroid hormone fragment (1–34) [hPTH(1–34)] was delivered from the device in vivo. hPTH(1–34) is the only approved anabolic osteoporosis treatment, but requires daily injections, making patient compliance an obstacle to effective treatment. Furthermore, a net increase in bone mineral density requires intermittent or pulsatile hPTH(1–34) delivery, a challenge for implantable drug delivery products. The microchip-based devices, containing discrete doses of lyophilized hPTH(1–34), were implanted in eight osteoporotic postmenopausal women for 4 months and wirelessly programmed to release doses from the device once daily for up to 20 days. 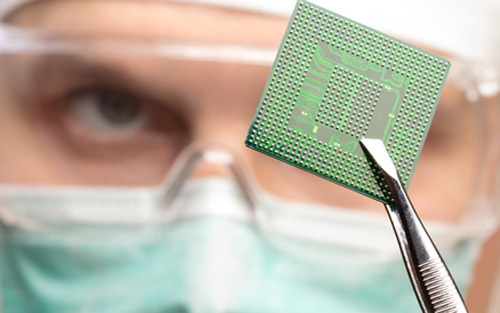 A computer-based programmer, operating in the Medical Implant Communications Service band, established a bidirectional wireless communication link with the implant to program the dosing schedule and receive implant status confirming proper operation. Each woman subsequently received hPTH(1–34) injections in escalating doses. The pharmacokinetics, safety, tolerability, and bioequivalence of hPTH(1–34) were assessed. Device dosing produced similar pharmacokinetics to multiple injections and had lower coefficients of variation. Bone marker evaluation indicated that daily release from the device increased bone formation. There were no toxic or adverse events due to the device or drug, and patients stated that the implant did not affect quality of life. Implanted medical devices have been around for a while and their uses range from simple mechanical support (joint and bone replacements) to delivery of a drug through an external pump, and include direct control of key organs, such as the pulse of the heart through a pacemaker. While the existing devices are sometimes fairly complex, the next-generation implantables are expected to serve even more complex functions as in the example of a fully implanted drug delivery unit that is responsive to the changing needs for the drug being delivered. Unlike a drug delivery pump, which typically remains attached to the body and has only a feeder line implanted into the patient with all the device controls and access ports being available on the outside, a fully implanted device would be expected to remain autonomous for extended periods of time. Under such conditions, issues such as drug stability, reliability of drug release, acceptance of the device by the host, and stability of communication to control the drug delivery regimen, will all have to be resolved. The present work provides key evidence that producing such small, fully implanted, remotely controlled drug delivery devices is possible. Robert Langer’s team used human parathyroid hormone fragment 1–34 (hPTH(1–34)) as the proof-of-concept drug in a clinical trial of an implanted microchip-based drug delivery device controlled through wireless communication (Figure 1). hPTH(1–34) is the active ingredient of teriparatide, a drug used to treat osteoporosis in patients with elevated risk of bone fractures. The delivery of teriparatide needs to be controlled very carefully because its continuous administration can lead to the unwanted effect of promoting bone loss. The implanted delivery device therefore consisted of two microchips containing 10 small drug delivery reservoirs each; these were designed to deliver individual drug doses of 40 μg upon electrothermal ablation of a thin metallic membrane that covered each reservoir. Figure 1. 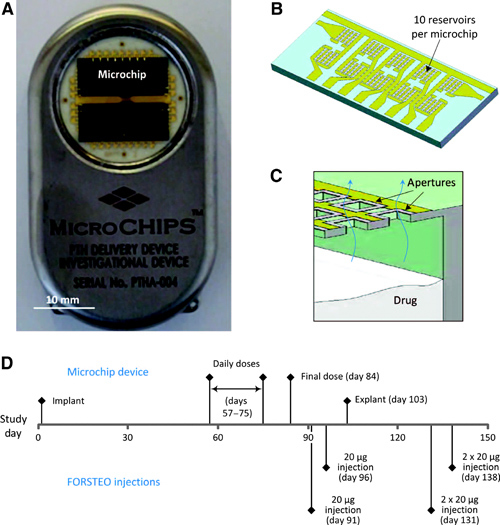 The microchip-based drug delivery device and overview of study design. (A, B) Microchip-based hPTH(1–34) drug delivery device (54 mm × 31 mm × 11 mm, l × w × h) (A) containing two microchips with 10 reservoirs each (13.0 mm × 5.4 mm × 0.5 mm, l × w × h) (B). (C) Schematic cross section of microchip assembly showing drug releasing from one reservoir. (D) Timeline of study events. Seven patients were subjected to the trial, which involved implantation of the device in their abdominal area through an outpatient surgery. After waiting for almost 2 months to create conditions of a fully tissue-encapsulated device, the authors initiated daily dosing of the drug for 20 days; the devices were removed after approximately 3.5 months. PK monitoring of the drug level indicated overall stable and adequate levels of hPTH(1–34), with good rates of absorption and distribution. Evaluation of the histology of the tissue surrounding the devices (referred to as capsule tissue) indicated normal wound-healing responses with very few inflammatory cells, and no malignancies or bacterial infections were noted (Figure 2). Moreover, the bone markers indicated adequate dosing and in-range responses to the drug, while the test subjects did not experience any out-of-the-ordinary discomfort and managed the post-implantation and -explantation pain with 2-day administration of over-the-counter pain medications. It is expected that these very encouraging results will be followed by the expanded testing of a device that ensures delivery of a drug for at least a 1-year period. Figure 2. Tissue histology results from a representative patient, MC-0012. 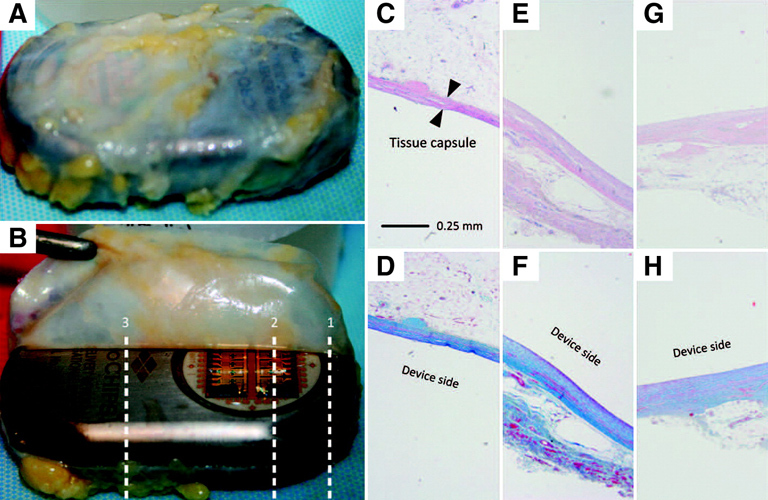 (A, B) Two representative macroscopic images of the tissue capsule surrounding the device after explantation. (C–H) Micrographs of the tissue capsule from each patient consisted of three total images from both the dorsal (antenna, toward skin) and the ventral (microchip, toward muscle) sides. Top row, H&E stain; bottom row, Masson’s trichrome stain. (C, D) Cross-section 1 at the microchip and titanium interface (dorsal). (E, F) Cross-section 2 over the microchip (ventral). (G, H) Cross-section 3 over the titanium case (ventral). Anton Simeoniv works at the NIH.